For some students, traditional teaching methods will simply not work because they tend to be more artistic and really have a hard time taking advantage of their artistic skills when completing assignments in mathematics, social studies, language or science. Yet, they have great academic skills in music, dance, drama and arts. « Learning through the arts » is a great resource to help answer the need of those students. It is sponsored by the Royal Conservatory of Music and financially supported by Heritage Canada and Culture.ca. It includes complete lesson plans and student worksheets as well as ideas and videos. The author of the lesson plans were able to include the arts in various subjects including aboriginal education, French, English, health, technology, physical education, social studies, history, mathematics and science. 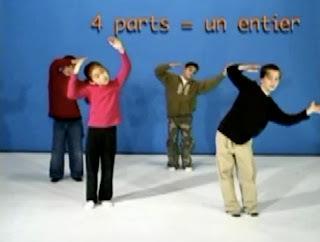 On this picture, you can see a lesson in mathematics about fractions being taught using dance. A very well designed search feature will help you find appropriate lesson plans by entering criteria such as subject, region, artform and type. Lesson plans can be found in both English and French.